The date was June 16, 2007. I arrived at the beach around 10am and fed the meter for a couple hours worth of fun. I, instead of visiting with my husband's family out of town, had come to see a Jamestown 400 reenactment of Captain John Smith's 1608 expedition. Colonial Beach was one of the 20 or so stopping points along the route. Admission was free and it was the place to be! Four hundred years after his initial visit to what would later be known as Colonial Beach, a 28-foot reproduction of the Captain's shallop filled with a crew of 12 rowed towards the Town Pier and landed on the beach to give a history lesson. It was Day 36 of their 121-day voyage. 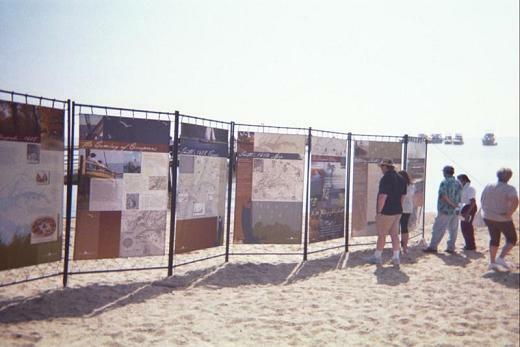 It was Day 8 of the Colonial Beach "Celebrating Jamestown 400" festival, which ran from June 8th through the 17th. For some reason, I was expecting a big Viking-style ship or something. Turns out the original vessel that was used probably had to be split into pieces when it traveled to America in the cargo hold of the Susan Constant. It was then reassembled upon arrival in Virginia. The shallop used in the reenactment is a full-scale reproduction, built at the Sultana Shipyard in Chestertown, Maryland using period materials and construction techniques. The crew, consisting of of modern-day explorers, historians, naturalists and educators were all dressed in period garb, and it took a lot of restraint for me to jokingly keep from asking them whether they had any trouble with Indians on the way in. I figured they'd probably heard that one enough already. On the original voyage, Smith and his crew came in contact with a Wiccomico man known as Mosco. Atypical of Indian culture, he had a heavy beard, possibly an indication of European descent. He was happy to finally meet some fellow hairier than usual humans because his tribemates had frequently teased him about his "condition". Mosco then aided Smith and his crew in navigating up the Potomac (then Patawomeck) River. A local priest performed a blessing for safe journey and a school band from the next county over performed a couple of tunes for what was now a very large crowd on the beach. I'm glad I arrived there when I had. Some women from the local Historical Society were there dressed in their Victorian-era garb. They looked beautiful, although slightly out of date, shall we say? I felt sorry for them as the sun was shining brightly and it was a warm day. Not a good time to be covered in layers and layers of fancy dresses. 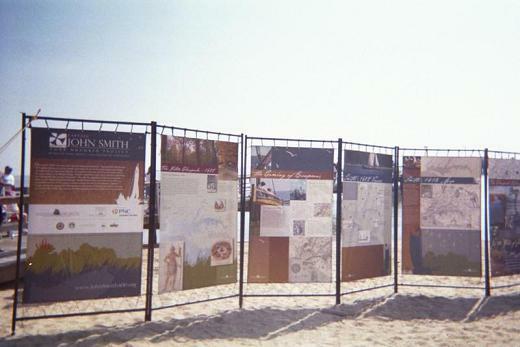 Local Post Office representatives were selling commemorative items, and a giant Captain John Smith Four Hundred Project exhibit board was erected in the sand on the beach chronicling the entire journey. Marc Castelli is the artist who's work was featured in the exhibits. After snapping a few more pictures, I gave a bid of farewell to "Captain Smith" and his courageous crew and wished them well on the remainder of their journey.